A driver who ran over a teenage cyclist has been found guilty of murder and sentenced to life imprisonment. Kyle Beckford, 22, of Waleys Close, Luton, had pleaded guilty to the manslaughter of 19-year-old Delaney Brown, at Luton Crown Court. A jury unanimously decided Beckford, who was behind the wheel of a stolen BMW, had meant to run him over. Mr Brown died last September after being knocked off his bicycle in Vincent Road, Luton. Beckford was told he would serve a minimum of 24 years. During the trial, the jury heard how on 5 September the series one BMW driven by Beckford had mounted the pavement and hit the bike Mr Brown was riding, causing fatal injuries. It was revealed in court that the crash had been part of an on-going dispute between gangs in the town and there were three other young men in the car and another was riding a moped. The jury heard how as teenage boys, Beckford and Mr Brown had been friends but, as they got older, had drifted into rival gangs. Beckford was a member of the Marsh Farm Gang which was in conflict with the Lewsey Farm gang of which Mr Brown was a member. Prosecuting counsel Stuart Trimmer QC told jurors there was "substantial hostility" between the two groups. In the weeks and months leading up to Mr Brown's death there were a number of "violent incidents" between them. During his testimony, Beckford denied "hunting down" Mr Brown saying he had only wanted to scare him because he suspected he had been involved in an ambush of his cousin some weeks before. Beckford also denied being a member of the Marsh Farm Gang and refused to name the other people in the car with him that day or who was riding the moped. 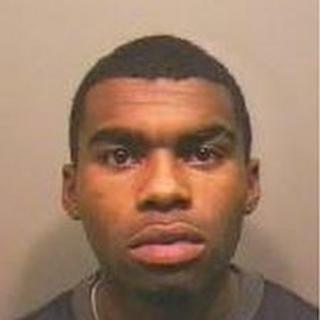 Sentencing Beckford, Judge Richard Foster said the message had to go out to those involved in gang culture that they could expect no mercy from the courts. "There can be no excuse for the men of this town to live in this gang culture," he said. Speaking after the verdict, Mr Brown's grandfather, Delaney Brown Sr, said the sentencing had sent out a message that the community "won't tolerate" the gang culture. "Justice has to be done but there is no pleasure in seeing a young man get 24 years minimum," he said. "They need to stop acting like kids, they need to act like grown ups. "This can be a wonderful community if we work it together." Bedfordshire Police said it had been "a difficult case" because it had taken time to encourage key witnesses to make formal statements. Det Ch Insp Stephen Collin said he wanted to thank those who "put their trust in the police" and showed "great bravery and courage" coming forward.